The report proposes a framework of four synergistic elements necessary to advance inclusion, empowerment and equality: rights and justice; norms and institutions; resources and capabilities; participation and voice. The need for action on all four fronts is illustrated by a deeper look at three pivotal challenges confronted by the region – (1) climate change and its potential to deepen inequality; (2) the urgent need to boost domestic resource mobilization; and (3) the need to strengthen social accountability and civic engagement. It draws out policy messages on how an empowerment-and-inclusion approach to policymaking can be fostered, including on addressing violence against women and girls. 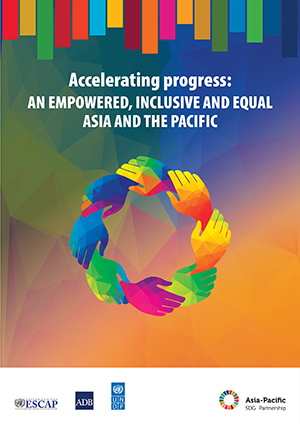 The report provides strong evidence that promoting empowerment and inclusion are necessary approaches to reduce inequality and accelerate progress towards a broad array of Sustainable Development Goals. It is a contribution to the ongoing national, regional and global dialogues on opportunities to empower people, ensure their inclusion and advance equality. The report is produced by the Asia-Pacific SDG partnership, comprising of the United Nations Economic and Social Commission for Asia and the Pacific (ESCAP), the Asian Development Bank, and the United Nations Development Programme.